At Quattro’s food production factory in Portsmouth, Hampshire, when we think of summer, we think of al fresco dining (if the weather permits! ), a glass of Pinot at hand and Mediterranean flavours tickling our taste buds. In preparation for summer, Quattro Foods development chefs have started creating light and delicious products that will compliment a summer menu, whether you are looking for a product to sell in a wholesaler or want to add them to your restaurant’s dishes. 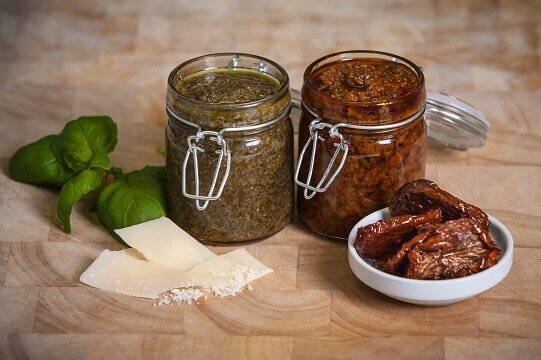 As part of our ambient range, we have been creating scrumptious, zingy sun dried tomatoes, which are tasty and also allows total convenience with their long shelf life. Sun dried tomatoes are an ideal component to add as a pizza topping, to a summer salad or mixed with a pasta dish; a perfect element to enhance your summer menu! Another summer favourite is our nut-free pesto, which provides a fragrant and unique flavour that can be added to pasta or pizza and also compliments new potatoes, sandwiches and chicken dishes. All of Quattro Foods’ pesto is uniquely nut-free and designed to suit a mixture of dietary requirements, so you can keep your customers happy. If you are needing a food solution in your kitchen, our development chefs at our Portsmouth food production factory can help. With their classical training, they have tried and tested many recipes and understand the need to create a product that is special to your kitchen and business. Our ambient food range is popular amongst large kitchens because they provide a time-cutting solution that doesn’t lose out on quality and flavour. With our traditional manufacturing methods and our home-style cooking processes, we can provide a product that you and your customers will love. If you would like to add some delicious summer flavours to your restaurant or wholesaler, get in touch through our website or ring our food production factory on +44 (0)23 9262 0020 and a member of our team will be happy to help. P.S. Keep up with our latest food creations by following us on Twitter! Here we talk about the latest news in the food and manufacturing industry and share what we have been working on in our busy kitchens.